This iExpression links a 2D property to the average of two other properties. Average means that the property is always in the middle of the two linked properties. This is, for example, useful to average two trackpoints to get a more precise and robust tracking result. 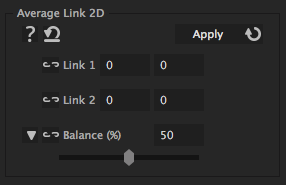 You can also compute weighted averages where one of the two points has a stronger influence than the other by using the 'balance' parameter.